The Lymphatic Education & Research Network (LE&RN) rallies supporters to stand with U.S. Senator Charles Schumer in his request to appropriate $70 million to the Office of the Director at NIH for lymphatic and lymphedema research funding. The Lymphatic Education & Research Network (LE&RN), an international leader in lymphedema and lymphatic disease education, research, and advocacy, applauded Senator Schumer’s leadership on the issue. LE&RN is urging supporters to contact the Senate Appropriations Subcommittee on Labor, Health, and Human Services and to sign an online petition directed at the U.S. Senate and particularly members of the Appropriations Subcommittee. In March, a petition, initiated by LE&RN, to declare March 6 World Lymphedema Day garnered thousands of signatures and resulted in a unanimous U.S. Senate vote to recognize March 6, 2016, as the first annual World Lymphedema Day. Founded in 1998, the Lymphatic Education & Research Network (formerly LRF) is a 501(c)(3) not-for-profit organization whose mission is to fight lymphatic disease and lymphedema through education, research and advocacy. LE&RN provides valuable educational resources for the millions of people who suffer from lymphedema and lymphatic disease. LE&RN fosters and supports research that can deepen the medical community's understanding of the lymphatic system. For more information about lymphatic disease or the Lymphatic Education & Research Network, visit http://www.LymphaticNetwork.org. U.S. 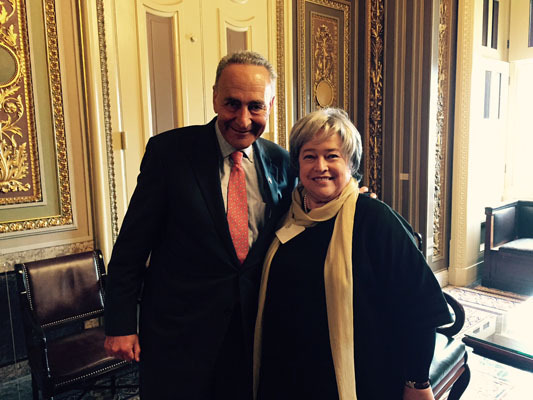 Senator Chuck Schumer met with LE&RN Spokesperson Kathy Bates in Washington, D.C. about dedicated research funding for lymphatics.Dedicated lymphatic disease funding is a priority for LE&RN. LE&RN is currently calling on supporters to back U.S. Senator Charles Schumer in his request to the Senate for $70 million in lymphedema and lymphatic disease funding.